Craft-e-Corner Winner – Woo Hoo!! I’m so Excited!! I cannot tell you how excited I am!! I entered a little contest where all you had to do was grab Craft-e-Corner’s badge/blinkie and put it on your blog and let them know. Then on a certain day they would look around for folks who had the badge and pick a winner. When I saw the Facebook post then got the email from Craft-e-Corner, I literally jumped up and down then ran downstairs to tell my husband that I actually won something!! I never win anything like this so I was super-duper excited. Well – a couple of weeks ago I got my loot!! 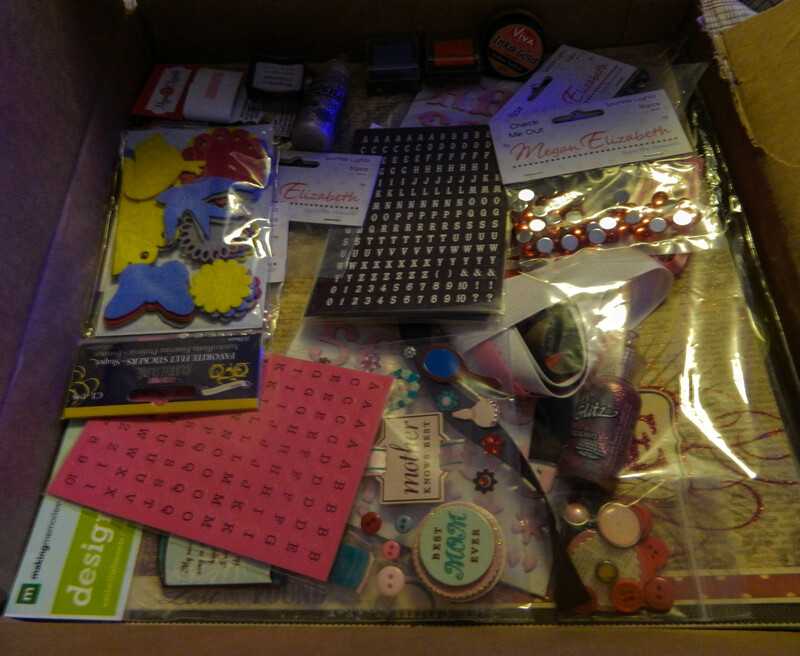 A $50 mystery box of goodies from Craft-e-Corner. I wanted to share my wonderful prizes with you to see how awesome Craft-e-Corner is!! Thank you so much Craft-e-Corner! I really appreciate the chance to win all these amazing goodies – you guys are so awesome!! Here are some photos from my prize and details on the loot! I’m so excited to craft with these awesome items!!! If you can’t tell already – there was a TON of stuff from Megan Elizabeth’s line from Above Rubies Studio (which of course if you know me at all, I have a major craft crush on her). Megan Elizabeth Mini Alpha Stickerz in Bachelorette, Deep Blue Sea, and Rainy Days In. Megan Elizabeth Stick Itz Adhesive Squares, Megan Elizabeth Ink Edgerz in Wrap Me in Chocolate, Sweetness, and Chillax, and then four – yes FOUR – packages of Sparkle Lightz (Girls Best Friend, Check Me Out, Uptown Girl, and Chillax). I’m in heaven!! I think it’s the I’m in Love Club Ruby Kit – My Minds Eye paper, Fancy Pants paper, pink brads, pink kraft letters, an assortment of ribbon, and more! Not sure about this one but it’s an Autumn related kit – has Paper Loft paper, Imaginisce paper, Bella Blvd paper, Moxie stickers, Perfect Pearls, metal brads and leaves, and some brown felts. Super cute for October/November!! Thank you again Craft-e-Corner – ya’ll are awesome!! Thanks for the chance to win. Remember to all of you out there: you can’t win anything if you don’t try!! This entry was posted in Creative Stuff, Paper Crafts and tagged Above Rubies Studio, craft-e-corner, free, megan elizabeth, mystery box, paper crafting, sparkle, win, winner by tiannafonz. Bookmark the permalink.